*Laboratoire de Recherches en Optique et Laser, Département de Physique, Université Laval, Québec, P. Q., G1K 7P4. The boundary-diffraction-wave theory is used to calculate the diffracted field in the shadow boundary region. 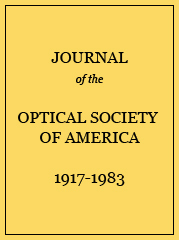 Discussions are based on expressions derived for a Gaussian beam incident on a circular aperture.